It appears a combination of Cameron scaremongery and weak-spending-driven GDP downgrades has sparked a realization in stocks (for now) that maybe bonds are on to something. As 30Y Yields drop closer to a 3.05% handle (and fresh 15-month lows), stocks have rolled over notably this morning… Of course, it is Friday though and all that pent-up de-escalation buying power on the sidelines is just itching for new new highs in stocks. One of the great economic myths of our time is Japan’s ‘lost decades.’ As Japan doubles-down on inflationary stimulus, it’s worth reviewing the facts. The truth is that the Japanese and US economies have performed in lock-step since 2000, and their performances have matched each other going as far back as 1980. Either Japan’s not in crisis, or the US has been in crisis for a good thirty-five years. You can’t have it both ways. This post was published at Ludwig von Mises Institute on August 29, 2014. *POLAND BLOCKS FLIGHT OF RUSSIAN DEFENSE MINISTER’S PLANE: RIA Defense Minister Soigu’s plane was forced to land in Bratislava. Having collapsed to 13-month lows in July – with the biggest miss on record – Chicago’s PMI rebounded the way only US macro ‘soft-survey’ data can. After plunging from 62.6 in June to 52.6 in July, August printed a magnificent 64.3 – its highest since May – showing up this data’s noisy nature as entirely useless. From worst miss on record (and 13-month lows) to best beat in 10 months and 5 month highs… brilliant. It would seem ISM has entirely given up on any credibility at all… However, given this exuberance (in production and new orders), the employment sub-index dropped yet again. TENSION between Russia and Ukraine as well as escalating violence in the Middle East have helped support the price of gold this week as it is often regarded as an insurance against financial and political risk. There are also signs of support from developing countries. Russia, one of the world’s biggest holders of gold, increased its official reserves by nearly 340,000 troy ounces in July, to 35.5-million ounces, according to data from the International Monetary Fund (IMF). The amount of gold now held by Russia is the most since at least 1993. Kazakhstan’s central bank added 45,000 ounces of gold to its reserves in July, to 5.1-million ounces. The IMF said the central bank of Ecuador also increased its reserves in July, by 10,000 ounces, while Belarus cut its holdings by 79,000 ounces. Turkey’s central bank reported a decline of nearly 138,000 ounces to the IMF, dropping its official reserves to 16.4-million ounces. 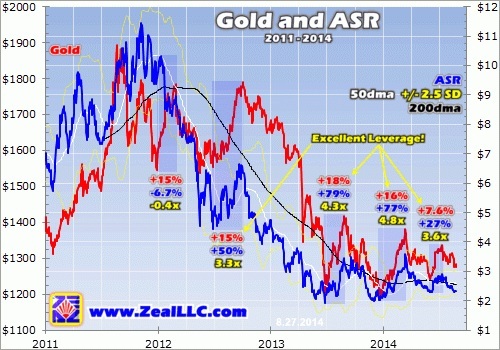 The pattern of trading in precious metals changed for the better this week. After London’s bank holiday on Monday, for the first time in a long time the market opened in London’s pre-market with higher prices. This indicated Asian or Middle-Eastern physical demand was returning to the market. Predictably, prices drifted lower during London hours as paper trading took over, and all the gains were more or less lost by close of play on Comex in New York. It was a similar story on Wednesday. Yesterday, (Thursday) started the same way, but this time the move gained more traction; but volumes remain pitifully low, in common with open interest. Today this pattern was not repeated with gold kicking off unchanged on overnight levels. 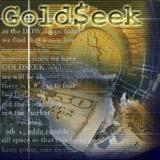 However, gold is up $15 on the week and feels more firmly based. Measured by deliveries on the Shanghai Gold Exchange, Chinese demand is increasing, with last week’s figure rising to 46 tonnes, having increased every week in August. So far this year over 1,200 tonnes have been delivered, and the extension of trading and therefore potential demand into the Free Trade Zone is due to kick off in September. 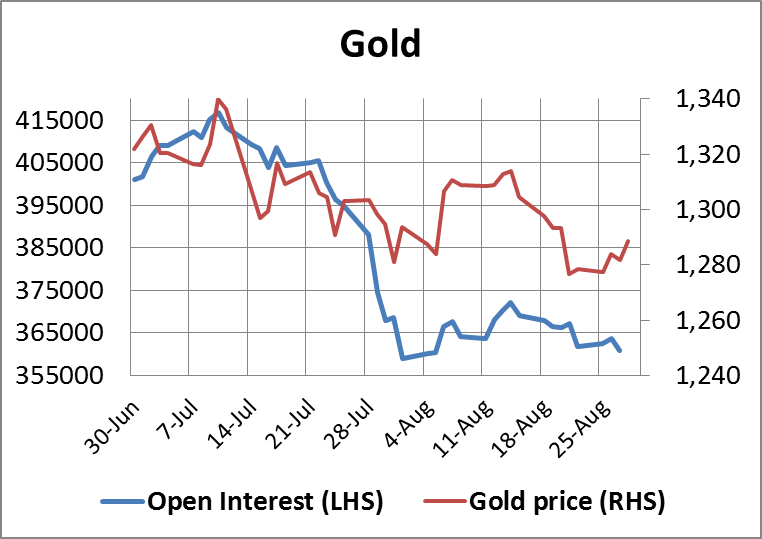 The chart of the gold price and open interest on Comex is shown below. While the government Conference Board confidence measure remains the most exuberant, University of Michigan Consumer Confidence continues to tread water. August final print rose to 82.5 from the preliminary data (79.2) driven by a surge in “hope” from 66.2 to 71.3 mid-month. Short-term inflation expectations fell on the month. Despite exuberant all-time highs in stocks, UMich has been flat for the entire year and is now at the least exuberant relative to Conference board data in almost 7 years.